I rode the Pioneer back in 1989 and thought it was a great train. I was really surprised that it was pulled when it was. I think it would be a great addition to the Amtrak line-up. Hope they bring it back. Is there any word about any special Seattle-Vancouver trains during the Olympics? My wife and I are planning on taking the train and meeting my parents in their car up there, because my parents have Nexus cards and can get through the border quick. Then we’ll all head up to Whistler. I think the only ‘Olympic Specials’ are the 2nd daily Cascade just started, and due to end at the end of the special olympics. That was hard enough to just get those going, given the lack of cooperation from north of the border. It most likely will be the final outcome. The FRA is rather backasswards on most of their decision making. Run fast trains between Tacoma on the bypass to as far south as they can (maybe all the way to Vancouver?). Build a parallel track or two, interchange with BNSF and UP near stations, or build new stations next to the existing one. Remember, the Coast Starlight most likely cannot use this new route since it can’t get onto the bypass w/o helpers (that would be so cool). There is a lot of flat, usable land south of Olympia that could be utilized for HSR. It’s also adjacent to the existing BNSF ROW. Or, build an entirely new electrified ROW between Seattle and Portland, using Alstom Duplex TGV’s! That would be awesome! I have no idea where this idea that the Coast Starlight will need helpers for a 2.5% grade comes from. The Coast Starlight will be fine departing or arriving with the two P42’s that it currently uses. There will be no train handling issues with running the Coast Starlight along the bypass by any means. So again, let me say that there will be no operational difference with the Coast Starlight using the Bypass, at all. Maybe have superfast HSR use the same tracks as regular trains between Tacoma, Seattle, and Everett because its hard to find extra ROW, but between Everett and Vancouver BC and Tacoma and Vancouver WA, build entirely new 220mph ROW. It would cost a few billion dollars but we can do it, California’s doing it right now. I just found some ROW on google earth!. It’s called I-5, completely grade seperated and the curves aren’t to bad. I wonder how much they want for it? Ah, but how are the grades? Some interstates have really severe “rollercoastering”, which isn’t tolerable in HSR. CA has not turned a teaspoon of soil yet on actual construction. True, but that doesn’t mean it’s not going to happen, it means they’re not ready to start construction yet. Oh, come on! 79mph is stupid, and I simply cannot believe that the WSDOT plans to retain this. With PTC installed — which is mandatory — the 79mph rule is *irrelevant* — PTC satisfies the requirements for going over 79 mph, and the PTC needs to be installed on all trains, freight and passenger. speed limits instead of the possible 90 mph speed limits. Either of those claims would actually *make sense*. Retaining 79mph speed limits after PTC installation is ridiculous, unless WSDOT is actually indicating that they’re planning to violate the federal PTC mandate. Does WSDOT actually mean what you indicated them saying? It is too bad WSDOT couldn’t use a Horizon set for a daytime train to Spokane as a demonstration. Aww – shoot, I’d be happy with Wenatchee. I think they should have looked at a fifth sub-option for the Pioneer, with the Seattle-to-Pendleton part being run over Stampede Pass through Ellensburg, Yakima, and Pasco. I looked at the Amtrak Pioneer study report some weeks ago, and noticed that among the list of all the elected officials who had consulted with them on the study, there was not one Washington elected official. I don’t think they looked at that route because the “North Coast Hiawatha” would be going that way. I would agree with you though, it would be better to have the Pioneer on that route and give those communities multiple trains, which means giving people more choices. No need to put another slow cross-country train on the SEA-PDX route when we would be better served using that “slot” for a high(er) speed Cascades train. I think they should have looked at a different suboption, running on the north side of the Columbia River Gorge rather than the south side! Why? BNSF might have asked for entirely different upgrades than UP did. And one of the notable things about the study is that *most* of the identified upgrade costs were in the gorge region. UP wasn’t asking for that much in Idaho or in Utah. Just started following transportation blogs recently, but I really have to wonder why we are bothering with conventional rail. Seems like a waste of money. Wouldn’t it better to save up for HSR along the routes people might actually use (Vancouver BC to Portland), instead of novelty trains that go cross country? If we do not improve current rights of way and equipment and thus revenue and passenger counts, there will be little reason for building some sort of Higher Speed Rail in this area. We delude ourselves here in the NW (as do several other areas around the country) if we think the doling out of federal monies is going to be based solely on some kind of merit system. The decision will be primarily political, and primarily directed at states regions which will guarantee the re-election of the current administration. We (WA and OR)play only a small part in that political equation and BC plays no part in it, thus it is imperative that we also show we can “do” rail here. Plus, regional rail services will feed into HSR, thus those more local services must be augmented as well. Thanks for speaking up Anc, and welcome. While I am in favor of passenger rail of any kind I always have this nagging question in the back of my head asking why we are settling for this slow incremental approach. Now with Brian’s note above that shared corridors will never get above 79mph it seems as if all this money we are pumping in to capital projects to increase speeds by one minute here and one minute there really aren’t going to do us any good in the long run because we’ll never get above 79mph. The only way we’ll ever get a true high quality and high speed regional rail system that will be really attractive to potential customers is if we make the jump to a high speed dedicated right of way system. And if we’re ever going to go that route I say why don’t we leapfrog the 19th & 20th century steel wheel on rail technology and go directly to maglev like the British are seriously considering. I know this comes up a lot, but it’s worth noting again: it’s often more important to get rid of slow sections than to add fast sections. 10 miles of track upgrades from 75mph to 150mph = 4 minutes of time saved. 2 miles of track upgrades from 10mph to 60mph = 10 minutes of time saved. The Amtrak Pioneer route I hope will make the final cut is different – instead of a Denver terminus, I’m aiming for a terminus in Los Angeles via Las Vegas. From Salt Lake City, route south past fabulous national parks to Las Vegas. From there, high-speed rail plans are chugging along very well to Los Angeles. I prefer non-electrified Talgo trainsets. Get the track up to speed first, then electrify if warranted. Saves enough money to make it possible. The electricity is needed for light rail and Las Vegas monorail. Rural routes don’t need electrification. Going fast is actually slow. Going slow is actually fast. Go ask Einstein. This route proposal makes SLC a complete passenger hub that should lead to a 2nd daily Amtrak Zephyr between the Bay Area and Chicago. Well, Einsteins theories only applied to things traveling near the speed of light. Relativity doesn’t apply to conventional physics. Speed of light: 670,616,629 mph. Speed of a conventional HSR train: 186mph. Rural electrification is the best place for it. Less stuff in the way, longer tangents, easy to grade separation, cheaper to install, easier to install, and it’s where the trains can travel the fastest. Just look at most of Europe where the trains run the fastest in rural areas. Keep in mind electricity has to go from city station to city station. Its not worth it to just electrify along certain stretches. Diesel-electric-electric locomotives tend to have many issues. Las Vegas monorail?! It would be far more economical to construct a conventional steel rail system than a maglev or conventional monorail. We’re talking cheaper by an order of magnitude. Then there are scalability, switching, storage, and capacity issues. Actually, I just posted a link in a post a little further up that shows that monorail style maglev technology (Transrapid) is quite competitive economically with conventional steel rail systems. Here’s the link again. Speed of light: 670,616,629 mph. Speed of a conventional HSR train: 186mph. light is 3600x faster than a HSR train. Don’t you love the metric system? Speed of light: 300 *thousand* km/s. light is 3.6 *million* x faster than an HSR train. Now if we ever get a train that goes 300 *thousand* km/h… oops, that’s over escape velocity and the train is now taking off into outer space…. Darn, I knew I’d make a mistake but still easier than whipping out a calculator. It’ll be like those Japanese manga with trains traveling through space. Taking sprawl to the next level! An electrified high-speed train travels at speeds that are “infinitely” slower than standard trains because they won’t be built. Let’s say one line somewhere does get built and can reach 200mph: It has a limited number of stops to maintain that speed, so fewer people use it and fewer can afford a ticket. Those people resort to other modes of travel, so for them the super-fast train is at a standstill. Faster is slower. Why are you trying to derail progress, Mike B? Electrification through rural routes offers minimal environmental benefits. Light rail needs to use the electricity where it can really do some good. People who want to go fast are subconsciously attached to the experience of driving. Are we there yet? Train travel is not like driving. Slower is faster because riding a train is the experience. The electricity is needed for light rail and Las Vegas monorail. There’s plenty of energy out there that’ll become more cost competitive as the price of oil goes up. Wind turbines in the mountains and solar panels in the desert with some kind of hydrogen/steam/battery based storage. There have been ideas of using electrified high speed rail corridors as part of an interconnected power grid of renewable energy. Two for the price of one. 40 years ago we had rural electrified railroads in this area. It was called the Milwaukee Road. Train travel is not like driving. High speed rail is not only competing with driving, it competes with air travel and intercity buses. Slower is faster because riding a train is the experience. The experience and comfort on a high speed train is still much better than driving or flying or Greyhound. Having a great experience and getting there just as fast (or faster) is why HSR is taking business away from airlines flying the same route. A transportation option that has good speed, frequency, reliability, and comfort sells well. Right now, we have the comfort and we need to improve on the rest. Even the Milwaukee wasn’t fully electrified. The wire ran from Othello to Seattle. The old GE boxcabs ran in this region. The stretch from Othello to Avery, Idaho was unelectrified. The wire started again in Avery and went over the Bitteroots ending in Deer Lodge, Montana. The Little Joes ran in Idaho. The line was never fully electrified. They electrified the mountain regions to help the steam locomotives over the passes. Credible estimates suggested that electrifying the “gap” from Othello to Avery would have saved the Milwaukee huge amounts of money and that they would have recovered their investment within 5 years. At pre-70s-oil-shock prices. The 70s oil shock promptly hit after the grossly incompetent Milwaukee management removed the wires. Oran, electrification is about 30% the entire cost of high-speed rail. As if track upgrades aren’t expensive enough, why add the costs of electrification? Oh, to go faster. 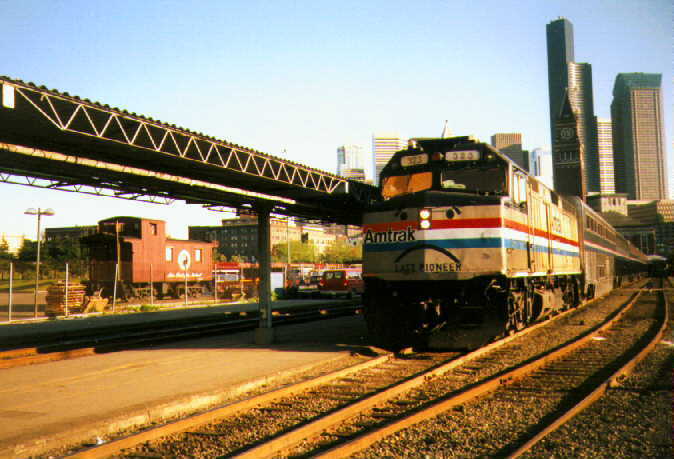 At an average 50mph, the Amtrak Cascades is fully competitive with driving and flying in terms of trip time between Portland and Seattle. Oh, let’s make it faster. Nevermind the nation’s many other rail lines that could add passenger service with affordable track upgrades; nevermind the light rail lines that could deal with our real problem, the insanity on the freeway, if scarce electricity were wisely dedicated. News flash! Windmill farm requires expansion of high voltage transmission lines from the Gorge to Longview… Land owners along proposed route having a cow! The “existing” Las Vegas monorail line needs expansion to increase ridership (much like Link needs expansion), 1 mile to reach the airport terminal, and 2 miles on the other end to reach historic Las Vegas casino district ‘Old Town’ and the train station, not quite doubling the length of monorail guideway, but more than doubling ridership. The WSDOT Amtrak Cascades Long Range Plan envisions 13 round trip trains between PDX-SEA at a travel time of 2:30 to quadruple current ridership at 99% farebox recovery in 2023 (seems unlikely now). There are reasons why we want to go faster. Faster trains mean shorter travel times, shorter travel times means higher productivity for equipment, labor and limited dedicated trackage. By faster, I mean a shorter running time. Maximum speed doesn’t matter as much as average speed. You’re making a big deal out of electricity which is very cheap (and clean) in the Northwest compared to the national average. Your claim of high speed trains taking electricity from light rail seems far fetched. How significant are the power requirements? The national electricity grid is pretty fragmented so we’re not taking electricity from Las Vegas. At least not physically, the transmission losses would be huge. And what happens when diesel prices spike? Transit buses and diesel trains are as vulnerable to fuel prices and shortages as drivers and commercial truckers are. The Talgos are more than capable of getting up to 110 mph on diesel but in the very long term we should be looking at electrification of all transportation. I support renewable energy development. Washington and Oregon have legally binding targets. We must make it happen. One argument for electrified rail is that it would serve as another electricity grid. I believe one purpose of the original streetcar lines was exactly this. One of the “pro business” types, forget who, suggested that the wind turbines follow the route of the rail lines across the prairies and fuel not only rail transport but the entire electrical grid. Pie in the sky maybe but it does sort of make sense. I think it was the idea of Texas oilman T Boone Pickens to use rail corridors for power transmission. 40% of Oregon’s electricity is generated from coal, so I’ve heard. Portland now has 50-some miles of light rail and plans for another 30 or 40 miles. Or, we could dedicate that electricity to high-speed rail. Currently, MAX provides about 110,000 ‘rides’ a day though capacity is probably double or triple that number. Amtrak Cascades trains run more than half full. Quadrupling ridership by tripling the number of daily trains may pencil out, but it could be done without electrification. The greater cost and real benefit are the track upgrades. My proposed Amtrak Pioneer route from Salt Lake City to Las Vegas and Los Angeles includes that last segment which has recently been added to the proposed California High-speed rail system and electrified. Non-electrification of that segment could allow extension north through SLC, Boise and Portland. Try thinking outside the box, Oran. High-speed rail, or an entire West Coast north/south route non-electrified through mostly rural country. The scale of sensibility tips heavily toward non-electrification on such a route. Only 8.5% of Washington’s electricity is generated from coal. In the city of Seattle, only 1% comes from fossil fuels (coal and gas). I guess we’re better off than Oregon. I don’t know how you came to the conclusion that electrifying mainline rail somehow takes electric power away from light rail. Numbers to back that claim up, please. In the EU, where most of their rail network is electrified, transport accounts for less than 4% of total electricity consumption. The growth in electricity consumption by transport is small in absolute terms compared to other sectors (Source: European Environment Agency). We should not be pitting rail against each other when inefficiencies and growth in population and jobs increase energy consumption much more than trains. I never said that electrification was needed to quadruple Amtrak Cascades ridership. The Long Term Plan assumes locomotives powered by diesel. Art, I wouldn’t jump to electrification on a new route but it is something we should look at long term as we build ridership. And before we try to create high speed routes that are over 600 miles long through mostly rural areas, lets spend our money on improving shorter, more densely traveled corridors like Amtrak Cascades and California High Speed Rail. That’s where the travel demand and congestion is. Well Oran, high cost is putting the California high-speed rail project in jeapardy. Electrification adds about 25% but I wouldn’t be surprised if that figure were 30% or more. I’m not ruling out eventual electrification. Rather, I’m saying start with the main investment in track upgrades and non-electrified trainsets like TALGO designed to reach 135-150mph. Strengthening my argument, non-electrified systems could lead to the Amtrak Pioneer route I suggest in my first post, Los Angeles-Las Vegas-SLC-Boise-Portland-Seattle and use the same type train as the Cascades. What’s so hard to understand about that? How’d you like a direct route to SLC or the National Parks and Las Vegas? C’mon. BNSF Chairman Matt Rose said that he was seriously looking into electrifying the system, and that it would save them money in the long run, but that right now they were very concerned about the cost of capital. (A private company doesn’t want to go bankrupt developing a system which will be highly profitable later, because it will be highly profitable for *someone else*.) I actually wonder if the backing of Berkshire Hathaway will make them reconsider — Buffett, sitting on oodles of capital, knows that railroads need vast amounts of capital and if the business case is made to him we may see freight mainline electrification. Lloyd, thanks for the welcome. I thought that cross country hauls weren’t profitable in the straight dollars and cents meaning of the term? While there might be other reasons to support them, profit wasn’t one. If so, want these just be more of a drain on already fragile Amtrak budget. Or am I just misreading what ‘farebox recovery’ is? Train X costs $2 to run, but the passengers only pay a total of $1, so the fairbox recovery is 50%. It’s revenue divided by operating costs. They aren’t profitable. Each time some politician tries to kill Amtrak, the other politicians say “wait, Senator Joe gets to keep his train, but the citizens in my state lose their train. I don’t want my citizens losing their train so I’m voting to fund their train” and Amtrak gets just enough money to sustain most of its trains and equipment, and is able to live for another year or two. This has been happening for the last 38 years. Finally, Obama decided to give Amtrak a little extra cash to fix all the broken stuff they have and give them a little wiggle room to maybe restart a train or two. But if the trains are operating at a loss, then won’t adding trains just create more costs down the line? How does that get us anywhere? As much as I loved DB when living in Germany, for a lot of America (talking area, not population) rail just isn’t practical. We should write those off, and instead focus on those areas of the country where rail actually makes sense. If as you say, we can’t do that for political reasons, we should at least stop throwing MORE money into that pit, which is how I read these expansions. Adding trains reduces the losses: many more people use all the trains more because there are so many convenient arrivals and departures. This is also why a second transcontinental ought to be operating along nearly the same routs as the current trains but 12 hours apart – and why connecting short haul (higher speed) feeder/corridor trains are so important for the transcontinentals. Lloyd, I just don’t see traditional trains every catching on enough for any kind of distance travel. It doesn’t really matter how many trains you have, most people aren’t going want to spend days getting to their destination, except as a trip unto itself (and Amtrak is no Trans-Siberian! LOL). Even if you can get them to lose less by increasing numbers (which I don’t really understand in this context) it is still losing money. Isn’t the Acela Express the only long distance train that doesn’t lose tons of money? Why not focus on those areas where money can be made, and then use any profits to subsidize the pleasure trips? I am not referring to Amtrak as we know it – a dysfunctional sad excuse for a public service organization. Instead, think about Germany or Spain or France or even England where not ALL the trains are running at speeds even close to 150 mph/225 kph. Every hour or so, the HS train stops and unloads folks unto and receives passengers from local/feeder trains. Now think ahead to the time in the not too distant future when petrol is US$10 or more per gallon. We can have electrically powered HSR, we can have long distance trains and we can have higher speed feeders to both those HS and long distance trains. Once that is achieved we start electrifying the feeder lines and the long distance system resulting, by about 2050, in a 50,000 mile interstate electric railway offering three levels of services: HSR, long distance, and feeder/short distance corridor trains. Be ready – it’ll cost a half trillion dollars, but think about the alternatives. The problem is that most of the country doesn’t have the density to support that kind of public transport. Such comparisons to Europe can really only apply to the coasts and a few other areas. Outside those areas (and between them) traditional rail simply isn’t ever going to be an option. I think that except for the intermountain west (border to border, east base of the Rockies to west base of Cascades/Sierras) you’ll find density in much of the US fairly similar to that in Spain. We built Interstate highways through all those areas, after all. Surely we can (as we once did) offer adequate rail passenger service in this country as well. Adding trains to the *same stations* reduces per-passenger and per-passenger-mile costs substantially. This is partly because “farebox recovery” includes a bunch of *fixed costs* like track maintenance, station maintenance, etc. Running a second train along the same route incurs very little of these fixed costs, but generates additional revenue. In addition, doubling the frequency on an appropriate routes tends to more than double the number of passengers, increasing the revenue per train. Particularly if it’s at a different time of day! The really interesting number is usually the ratio of new revenue to new expenses — or if you’re planning to cut a train, the ratio of lost revenue to avoidable expenses. Economies of scale and network effects such as these are why competent analyses often show that running one train a day will be a poor deal, but running five a day will be a great deal, even though it “costs more” upfront. The fatal flaw in the North Coast Hiawatha study was failure to consider appropriate scheduling; if there are two Seattle-Chicago trains, they really, really need to be about 12 hours off from each other, to maximize ridership. Part of Amtrak’s focus should be on improving cost recovery for the existing routes. If some of the LD routes could generate operating surpluses, those revenues could be used to expand services or invest in new equipment. Amtrak shouldn’t be thought of as a profit making enterprise. If there is ever extra money generated, it should go into maintenance, debt retirement and service expansion. As long as they can fill trains, fares aren’t too high, so fare reduction shouldn’t be a consideration in current conditions. I was wondering since Amtrak mostly runs on freight railroad tracks do they have to pay something to the railroads for use of their track? If so is it a significant amount? yes they certainly do. they pay an extra fee as a bonus for allowing amtrak to be on time. with freight traffic down such a significant amount the freights are bending over backwards to make sure amtrak doesn’t get put in a siding for hours cause they are so hard up for money. i don’t have specific amounts but its a lot. amtrak also has staffers at the various freight companies so if they are being held for a long time they call the amtrak bnsf passenger desk lets say and say hey we’ve been held here for an hour, that amtrak employee will then go lean on the dispatchers to help us move along. There seems to be something wrong with this. You say that Amtrak pays bonuses for on-time performance. Do the freights pay penalties when they delay passenger trains? I had thought that the priority of passenger trains was assured by the enabling legislation for Amtrak. Their “penalty” for delaying passenger trains is that they lose out on the on-time performance bonus. The freight railways are private companies and they own the tracks/rights of way. The enabling legislation for Amtrak requires that they host Amtrak trains, but if there is no more capacity on a particular section of track what can you do? This is why public money is going to fund capacity improvements on private railroads – it’s those transactions that are providing passenger priority agreements on those sections of track. The FRA is stupid. Why does the NEC get to run freight and passenger trains even with the passenger trains at up to 100+ mph? If I’m not mistaken on Amtrak ROW, that happens between Providence and New Haven. What is the difference on this side? Couldn’t we upgrade the track to Class VI and be done with it or Class V? For example, the City of Kent and Auburn doesn’t want a train running 90 or 110mph in their backyard. The city can impose a speed limit for “safety reason” until the particulars are figured out. It could be grade separating all crossings to fencing or it could be something silly like adding street lights. We could upgrade everything to Class 6 and have 110mph track along the entire corridor now but we can’t use the infrastructure if the cities aren’t in cooperation with each other. There are a lot of hurdles to increasing speed limits on the railroads. Currently with Class 4, the maximum speed is 79mph for passenger, 60mph for freight. The cities has imposed a 50mph restriction on freight trains however. The only 60mph segment is between Longview Jct and Vancouver, WA. To increase to 90mph, track would need to be upgraded to Class 5. This is part of the “corridor hardening” that you may have seen in the ARRA project list. This will reduce a lot of the slow orders on the line. Once the track upgrades are completed, installation of Positive Train Control within the track infrastructure, locomotives (on all passenger and freight locomotives)and cab control cars must be completed. BNSF will allow 90mph with mixed traffic but has requested a separated corridor for anything above 90mph. There are a lot of possibilities to go beyond the 2 hour and 30 minute marker but it depends if the state is willing to pay the extra money for the needed extra maintenance for track. This is again where if we had a public vote to get these funds then it would be much more feasible to look at the higher cost to get more trains faster instead of gambling on the stimulus funding. WSDOT nor our Governor isn’t that proactive when it comes to rail transportation since it is seen a “secondary” mode of transportation here. Its been shown that the Cascades can indeed make money but until some one comes out forthright and press the issue, it will be business as usual. No, the class 4 speed limit is 80mph for passenger; the 79mph limit is imposed by lack of an “automatic train stop” system such as PTC. PTC is mandated by 2012 or 2015 or something, so *hopefully* we can get that one mile per hour increase!!! “The cost of the train would be steep at nearly $1.2 billion dollars.” I have little knowledge of how much it costs for a service like this, but $1.2 billion does seem steep. Is this a start up cost, or would it be the annual operating expense? Could someone break down this figure for us readers? Thanks. As usual, that’s a start up cost, the capital investment required. Sloppy reporters always call this the “cost”. Annual operating expenses would be orders of magnitude lower. PIONEER is a vital link to rural Oregon and Idaho. I really hope they restore it. I think it’s so depressing the only rail stop in all of Idaho is Sandpoint. I personally would have ridden many times from the Boise area to Pocatello in my college years and would now welcome an alternative to flying home every year at the holidays – I’d gladly take a train!!! I just took the Cascades this weekend up to Vancouver, and I really hope that line can survive. It was great.